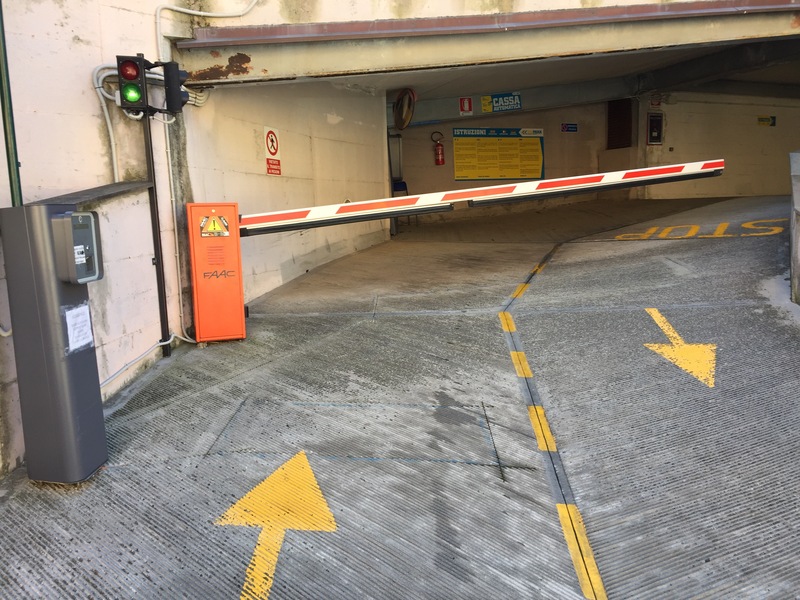 If you’re reading this, you’ve probably decided to forgo my advice to park beneath the station at La Spezia Centrale and train to the Cinque Terre (more details on that option can be found on my blog post here). 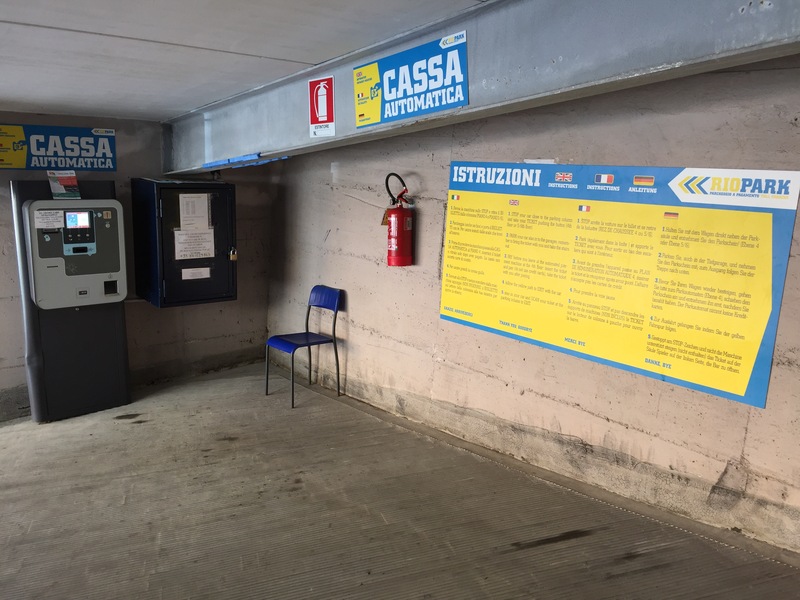 I’m happy to report that since last year there have been significant improvements made to Riomaggiore’s payment parking garage (including new signage and a new payment machine) helping to make things a little easier for visitors. It’s still far from perfect, but it’s a step in the right direction. 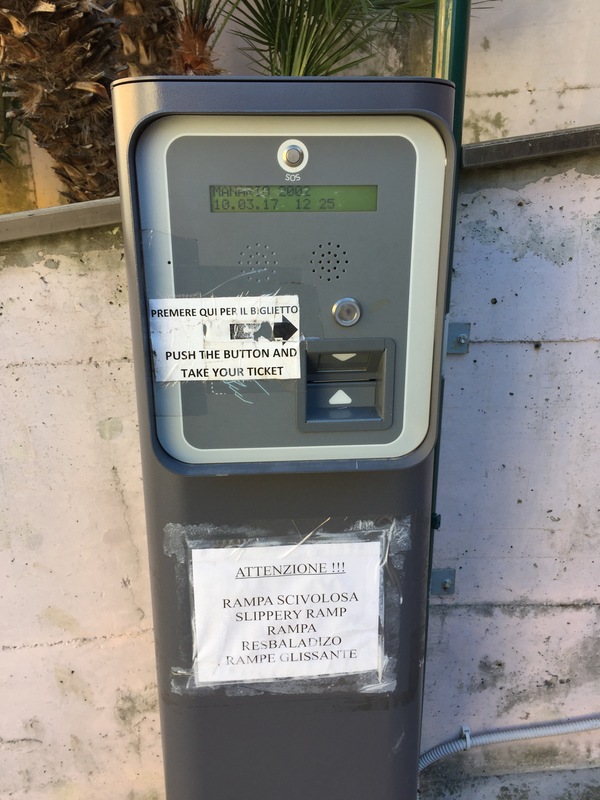 Keep reading so you know exactly where (and how) to park in the payment parking garage in Riomaggiore, even before arriving to the village. 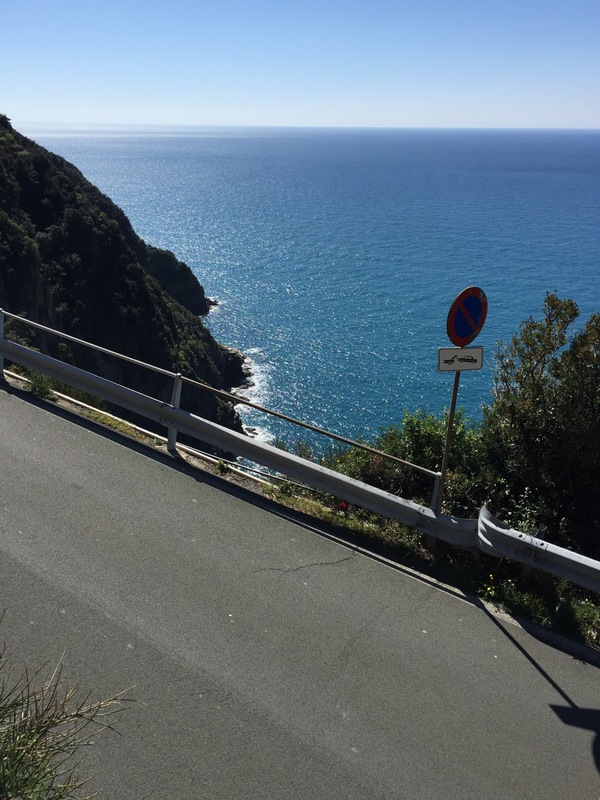 When you turn off the Litoranea (SP-370) for Riomaggiore, you’ll find yourself on a narrow and winding road (SP-32) leading down to the village. Stay to the right and keep in mind that despite the fact that there’s no median line, this road will have traffic coming in both directions. PSA: Unless you find a place to safely pull off the road, do not stop to take photos (yes, it’s beautiful but don’t risk your life or the lives of others by making this rookie mistake). When you arrive to the top of the village you will find yourself at a roundabout. On the opposite side of the roundabout you’ll see the Cinque Terre Point (which is the tourist information office). Just to the left of the TI office you’ll see a flat road with a gate blocking it and to the left of that you’ll see a road heading downhill. Enter the roundabout and take the road going downhill. Continue driving circa 30 meters down this road and just before the gate you’ll see on your left a blue and yellow sign that reads “RIOPARK” and two entrances to the payment parking garage (one entrance is numbered 4 and the other is numbered 5/6). There are lights posted by each gate indicating whether or not there are spaces available. If the light is green you’re good to go; if the light is red it means the garage is full. If the light is green, pull up to the ticket machine (you’ll need to stay to the left). Push the button to retrieve your ticket. As you pull your ticket out, the gate will automatically open so you can enter and park in an available space. When you are ready to leave the parking structure, first take your ticket and make your way to the payment machine located near the gate at garage 4. I’m happy to report that the cooperative that runs the parking garage invested in a new payment machine for 2018. It is now possible to pay not only with cash but also with your ATM or credit card (that wasn’t the case last year so this is a huge improvement!). Once you’ve paid, retrieve your car and pull up near the gate (remember, you’ll need to stay to the left). Scan your ticket at the machine and the gate will lift, allowing you to exit. It is not possible to reserve a space in advance. An emergency contact number is posted at the payment machine (in case you encounter unexpected difficulties or something is out of order). When the garage is full, your best bet is to move on (there’s really only space for one car per gate to queue, otherwise you’ll be blocking traffic and enraging locals trying to reach their dedicated parking spots). Do not park in the yellow lined spaces outside of the parking garage. These spaces are for local residents only and a permit is required to park there (this is a high ticket area, see my previous post for details). There are a few places where you can park for free, but these spaces are very limited and up to 1km from the village (I explain those options in detail in my previous post which you can find here). Super helpful post, Amy. It was a lesson for me, and I live in Riomaggiore! I am willing to try the free parking. Can you give me more information? I plan to write a post on the free parking situation in Riomaggiore within the next day or two. Thanks, will wait on suggestions. You are free to email me as well with insight that might make it easier. Will park for 2 days. Did read some visitors had luck paying less for private parking. Thank you for the useful, detailed, pictures included information. One thing reviews, blogs,recommendations have not addressed. Which I take as a positive. How safe are the vehicles from vandalism and burglary? In the 14 years of living here, I’ve only once heard of vandalism occurring on cars parked along the road. Of course, that’s not to say that it *can’t* happen, just that it’s highly unlikely. I think you are more likely to be dinged by a passing car with an inattentive driver than be the victim of vandalism or burglary. Of course, common sense says not to leave any valuables in sight. 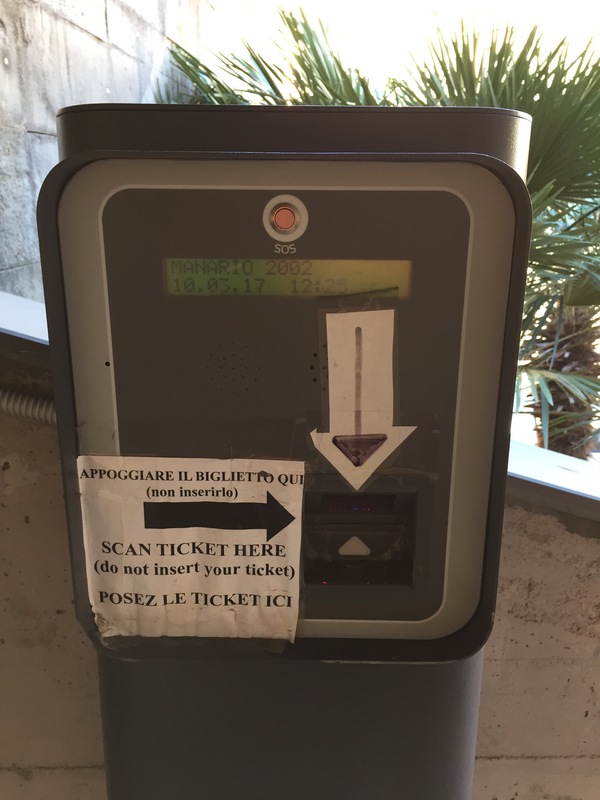 I’ve updated all the details on the payment parking garage in Riomaggiore for 2018. There are new rates and payment options so be sure to have a look!